Marine Corps Flags - All sizes from 4" x 6" stick flags up to 6' x 10'. Nylon or Polyester. Note stick flags are sold in 6 pc packs. 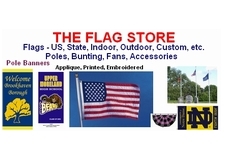 Air Force Flags - All sizes from 4" x 6" stick flags up to 6' x 10'. Nylon or Polyester. Note stick flags are sold in 6 pc packs. Army Flags - All sizes from 4" x 6" stick flags up to 6' x 10'. Nylon or Polyester. Note stick flags are sold in 6 pc packs. Navy Flags - All sizes from 4" x 6" stick flags up to 6' x 10'. Nylon or Polyester. Note stick flags are sold in 6 pc packs. POW -MIA Flags Nylon Single Face / Double Face. 3�x5� Poly Cotton material can be used for outdoor use as well as indoor. We use heavy white canvas header for extra strength. We also use 2 brass rustproof grommets in the header and the flag ends are double stitched to add extra durability and strength.